You might end up investing a lot of money implementing the best systems and processes but they will be of no use if your employees and customers do not adopt them; they might adopt these systems reluctantly but continue doing things the same old way. Hence it is important to invest time in educating them about the benefits of the new system, train them to use the new systems effectively and slowly transition them from the old systems to the new. i95Dev finds a lot of online businesses disappointed despite having a world class solution for handling their ecommerce needs. When explored further we found businesses confronted with challenges like – adoption of ecommerce increased the number of orders they now process requiring them to enter/ update this information manually in multiple systems. This process is not only prone to errors but also limits your growth because there is only so much that your resources can do manually. What these businesses lack is a seamless integration between these isolated systems which can automatically sync these systems. For you to be successful it is important that you identify these dependencies and integrate the right systems. The integration can also help you improve the customer experience by giving them access to the real time inventory, avoiding taking orders for products out of stock, providing updates on the order and shipment status, etc. ; everything that you need to take your business closer to the B2C experience. In the hurry to join the race are you adopting the first solution that meets your current requirement or are you carefully considering your current and future needs before choosing the solution? The most successful businesses are the ones that adapt to the changing environment. For you to be successful it is important that you keep growth and changing environment in mind and adopt a scalable solution. The system you choose must allow you to add new features, easily handle the growth in your company and must also evolve embracing new technologies as the business environment changes. Unlike B2C, B2B businesses have more product and process variations. In B2C you might offer the same product to all your customers with some basic customization, but in B2B the same product can be customized in multiple ways to meet the requirement of your customer. Moreover B2B is known for offering very different prices for the same product depending on customer, quantity, etc. 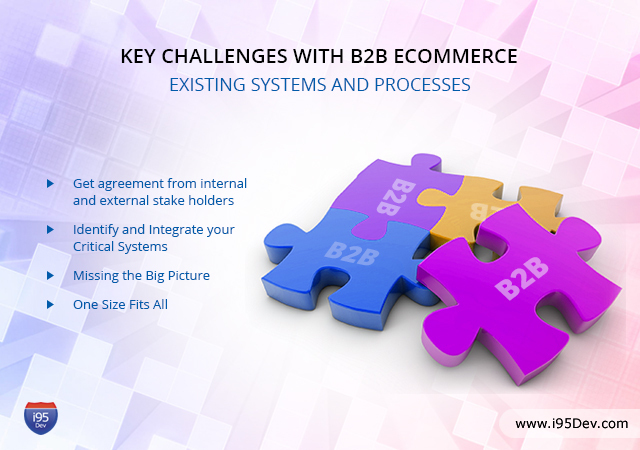 This and others make it difficult for B2B businesses like you to adopt any one size fit all solution. You require a solution which will allow your customers to customize the product the way they want and you to customize the process (pricing and others) the way you want.